With Xmas less than a month away, here at Wineware we thought we’d suggest our ‘ Top 5 Christmas Presents for Him ’. We know it can sometimes be a tough choice on choosing what to get your husband, boyfriend or brother, but we’ve listed below 5 options which we believe will be perfect. We’ve got most bases covered, specialist glassware for both Beer and Whisky, Wine Decanters for the red wine fan, quirky and educational wine maps and charts and easy to assemble wine racks so he can neatly store that ever growing collection of wine! Here at Wineware we stock a wide and varied range of Beer glasses, from the traditional heavy based tumblers to stemmed tulip shaped glasses to proper beer tankards! We even have a beer specific range from Spiegelau, these ‘Beer Classics’ feature glasses that are perfect for Ale, Lager, Pilsner, IPA (Indian Pale Ale) and Wheat Beer. 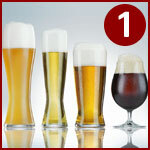 Our choice is vast so there are plenty of different beer glasses to choose from! Why buy? Who doesn’t enjoy a nice cold beer?! If your Dad enjoys a nice drop of Whisky, then now’s the time to give him a decent set of Whisky glasses this Christmas! 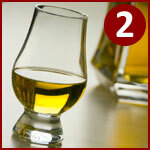 Likewise with our beer glass collection, we stock a large and varied range of glasses that are perfect for Whisky. Our most popular whisky glass is the ‘Glencairn Official Whisky Glass’ which is seen and used worldwide by connoisseurs and master blenders. We also stock more traditional heavy based Whisky tumblers from the likes of Schott Zwiesel and Spiegelau which are perfect for the whisky traditionalist who likes to add a touch of water or ice to their whiskies. Why buy? You can’t enjoy a great whisky without a decent set of glasses! If you and your other half enjoy a nice drop of red wine from time to time, then why not treat him (or yourself!) to a Wine Decanter! Decanting wine is sometimes seen as a ‘posh’ thing to do but it’s becoming increasing more popular and rightly so. It will really help and improve the taste of your wine, increasing the aeration process bringing more flavours out of your favourite red wine! 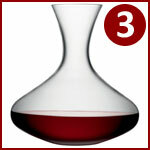 We hold plentiful stock and a wide range of different wine decanters, covering all price ranges. Why buy? Decanters increase your overall enjoyment of wine. If your Dad, Brother, Boyfriend or Husband is mad about Wine, then what better way to really impress him this year than with our ‘De Long Wine Grape Varietal Table / Chart’! The educational table covers 184 of the World’s most famous grape types and comprehensive informs the user of the different grape varieties used in the wine appellations. 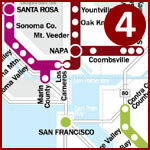 Additionally, if he’s keen on French, California, Italian or Iberian Wines, then our range of Wine Maps will educate him about his favourite wine region! Why buy? Fun, educational and look brilliant on the wall when framed. If your other half has a growing collection of wine but has nowhere to store it, why not treat him to his very own wine rack! Storing wine in the right and correct way is vital to when it comes to drinking, but also so it doesn’t get damaged or knocked over. 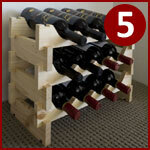 Storing wine in one central place will tidy up your home and also adds a feature to the room. When your friends or family come round, you can talk about your collection and easily locate the bottle you’re looking for! Why buy? Store and collect wine in the perfect surroundings. There we have it, ‘Wineware’s Top 5 Christmas Presents for Him’, that are sure to be a little different and add a smile to his face this Xmas! If you can’t think of what to buy him, then why not opt for a Wineware Gift Voucher and let him pick and choose for himself! Additionally, click here to see our Christmas Gifts section for other goodies, including our Christmas Stocking Fillers.